Hydrodynamic and pollutant transport models are useful tools for evaluating remediation options for polluted water bodies. These models span the range from highly theoretical, fine resolution, physically-based designs to lumped, black-box representations of real world phenomena. 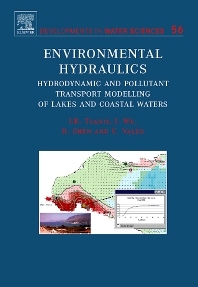 This book examines the numerical approaches used in hydrodynamic and pollutant transport modeling. First, the theory and physical basis of transport and mixing in lakes and coastal waters are provided. Methodologies that use a three-dimensional (3D) approach to predicting the fate and transport of pollutants are presented and this is followed by a presentation of alternatives to 3D circulation modeling as well as new advances in the field. These alternatives offer near 3D accuracy but without the computational burden. Illustrations of the calibration and verification of these models using laboratory data, as well as, field data are also provided. The models are applied to a diverse array of study sites ranging from The Great Lakes in North America to the coastal areas of Northern Crete. Sanofi-Aventis Inc., New Jersey, U.S.A.
Ford Motor Company, Dearborn, Michigan, U.S.A.